Posted on February 6, 2019, by Daphna Baram & filed under News. During January 2019, at least 39 structures were demolished in the occupied Palestinian Territories (including East Jerusalem) by Israeli forces, displacing at least 44 people- including 18 children- and affecting a further 181 people, including 107 children (according to OCHA oPT). In the Naqab desert, southern Israel, the unrecognised Bedouin village al-ʿArāgīb,, was demolished for the 138th time. In the village of As-Simiya, Hebron, a small school was demolished for the third time, preventing from 45 students their basic right for an education. 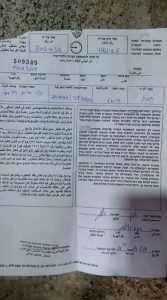  On 1 January, 2019, Israeli Civil Administration personnel along with Israeli forces confiscated three tents that were erected by the Palestinian Ministry of Education to serve as a school in the village of As Simiya, Hebron. This is the third time Israeli forces have confiscated the school’s structures, after doing so during December 2018. During the incident five tables, 15 chairs and the latrine unit were confiscated, affecting the school’s 45 students and five staff members.  On 2 January, 2019, personnel from the Israeli Ministry of Interior and the Jerusalem municipality along with Israeli forces demolished a 90 sq m residential house in Qalandiya, East Jerusalem. During the demolition the house’s access road was bulldozed, several trees were uprooted and furniture was buried under the rubble. The demolition displaced a family of six, and affected another family of six, including three children.  On 10 January, 2019, Israeli forces demolished and confiscated two structures in the village of Imreiha, Jenin. The structures comprised of a caravan in which the family lived in and a mobile latrine. The demolition displaced the family of four, including three children.  On 10 January, 2019, Israeli forces demolished the entire unrecognised Bedouin village of al-ʿArāgīb, in the Naqab desert, South Israel, for the 138th time.  On 11 January, 2019, a Palestinian family was forced to self-demolish a 30 sq m extension to their house in Jabal al Mukabbir, East Jerusalem. The extension- a sitting room and a toilet, was built three months ago. The family received a demolition order at the beginning of the month, ordering them to self-demolish the extension or have the municipality do so and pay the expenses. One person was affected .  On 13 January, 2019, Israeli Civil Administration personnel along with Israeli forces demolished six residential and agricultural structures in Beit Iksa, Jerusalem. Eight households comprising of 48 people, including 27 children were affected.  On 16 January, 2019, Israeli Civil Administration personnel along with Israeli forces demolished two residential structures: an inhabited residential caravan and a residential structure that includes a kitchen and a toilet, in the herding community of Fasayil al Wusta, Jordan Valley. The demolition has displaced the family of seven, including five children. This is the second time the family has had its home demolished, after Israeli forces demolished it in December 2016.  On 16 January, 2019, Israeli Civil Administration personnel along with Israeli forces demolished two structures: an under-construction residential structure and an animal barracks, in the community of An Nuwei’ma Al-Fauqa Bedoins, Jordan Valley. The demolition has affected a family of six, including four children. The family reported they had not received a demolition order for the structure that was under-construction.  On 17 January, 2019, a family was forced to self-demolish their 84 sq m house in Jabal al Mukabbir, East Jerusalem, displacing a family of five, including three children.  On 18 January, 2019, Israeli forces carried out a punitive demolition, blowing up a residential apartment in Al Heila, Yatta, Hebron. The apartment belonged to the family of Khalil Jibreen, a young Palestinian who is accused of carrying out a stabbing attack against an Israeli settler in September 2018. The demolition displaced a family of six, including one child.  On 19 January, 2019, a Palestinian family from Tur’an, near Nazareth, North Israel, was forced to self-demolish their house. Saba Safouri has been living in the house for the past 20 years with her four children: “After we received the first demolition warning, we kept trying for long years to purchase our land from the state [Israel], but we were facing a wall of rejection every time at the pretext that the law says that any structure build on state land must be demolished first before talking about purchasing the land,” Safouri said. The house had been built on the land of her ancestors that became refugees in 1948. The Israeli authorities had seized the land under the“Absentee Property Law”.  On 20 January, 2019, Israeli forces demolished a house in Lod, a city in central Israel. This is the second time Israeli authorities have demolished the house of Mahmoud Abu Soa’louk, owner of the house.  On 20 January, 2019, a family was forced to self-demolish their 64 sq m house in Wadi al Joz, East Jerusalem, displacing a family of four, including two children.  On 20 January, 2019, a family was forced to self-demolish a structure they planned to use as a car repair workshop in Al‘Issawiya, East Jerusalem. The demolition affected a family of nine, including seven children. The car workshop was demolished by Israeli forces twice in the past years.  On 26 January, 2019, a Palestinian family was forced to self-demolish two rooms inside their house: a bedroom and a living room that were built two and a half years ago.  On 22 January, 2019, Israeli forces demolished in Jaba’, East Jerusalem, six structures including: two agricultural structures, three retaining walls and a water network. During the demolition 50 olive trees, six water tanks and 25 barrels were also damaged. 15 people from three households, including six children were affected.  On 23 January, 2019, Israeli forces demolished an under construction water cistern and pool in Khalaya al Mogrhabi in Hebron city. Ten people from two households, including five children were affected.  On 26 January, 2019, a Palestinian family was forced to self-demolish parts of their house in Silwan, East Jerusalem. The family had to demolish two extensions of the house that were built in 2015-2016, affecting four people from one family, and displacing one child whose bedroom was demolished.  On 27 January, 2019, a Palestinian family was forced to self-demolish their house in Silwan, East Jerusalem. The small house was built ten years ago. The family tried to fight the demolition in court but lost their case. The demolition has displaced a family of three, including one child.  On 28 January, 2019, Israeli forces demolished an agricultural structure in Al Khadr, Bethlehem, affecting a family of ten.  On 29 January, 2019, Israeli forces demolished two agricultural structures, including a water pool in At Taybeh, Hebron, affecting a family of five , including two children.  On 30 January, 2019, Israeli forces demolished a 70 sq m residential house in Silwan, East Jerusalem. According to the family, they had constructed the house immediately after the demolition of their old house in October 2016, in the same location. After receiving a demolition order, the family took the case to court but they lost their case. A family of eight, including five children has been displaced as a result of the demolition. 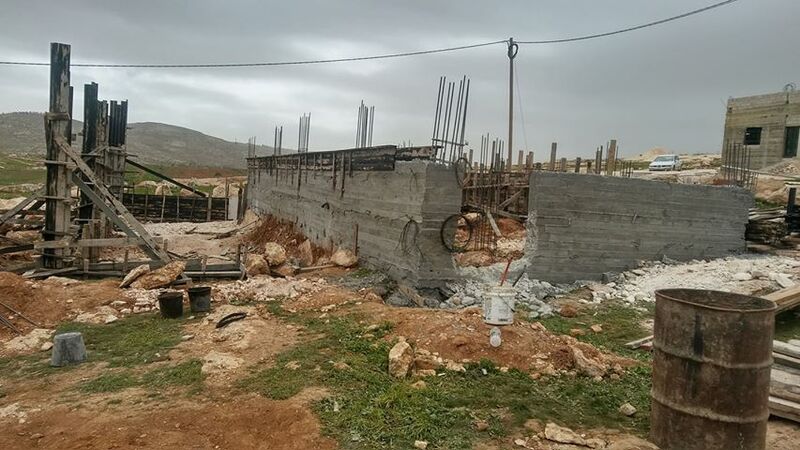  On 30 January, 2019, Israeli forces demolished the foundation of a house under construction in Huwwara, Nablus, affecting a family of three, including one child.  On 30 January, 2019, Israeli forces dismantled and confiscated two commercial structures in Khirbet ad Deir (‘Tuqu), Bethlehem. 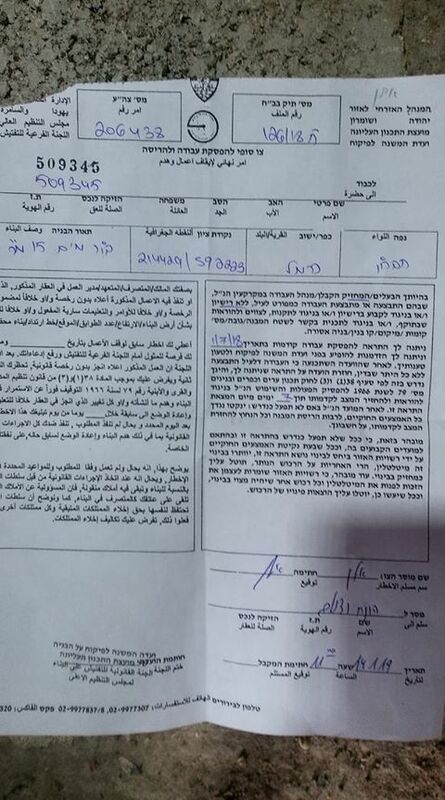 During the incident, Israeli Civil Administration personnel delivered two stop work orders against a cement plate and a residential house, affecting 17 people from two families, including seven children.